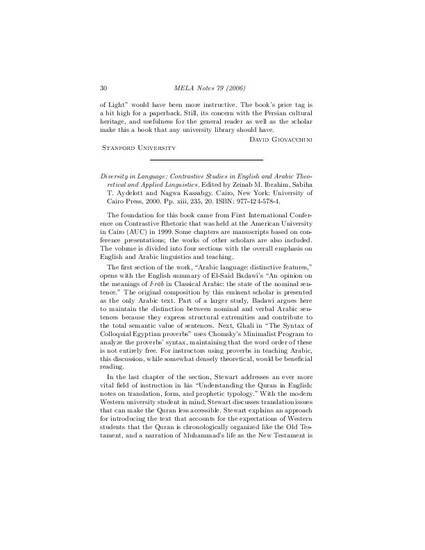 Book review of Diversity in Language: Contrastive studies in English and Arabic theoretical and applied linguistics. Edited by Zeinab M. Ibrahim, Sabiha T. Aydelott and Nagwa Kassabgy. Kern, Kristen. Book review of Diversity in Language: Contrastive studies in English and Arabic theoretical and applied linguistics. Edited by Zeinab M. Ibrahim, Sabiha T. Aydelott and Nagwa Kassabgy. Cairo, New York: University of Cairo Press, 2000. Pp. xiii, 235, 20. ISBN: 977-424-578-4. Published in MELA Notes, Number 79 (2006): 30-33.